Back in March I was invited to participate in the Conjuring Mischief group exhibition at Stranger Factory. 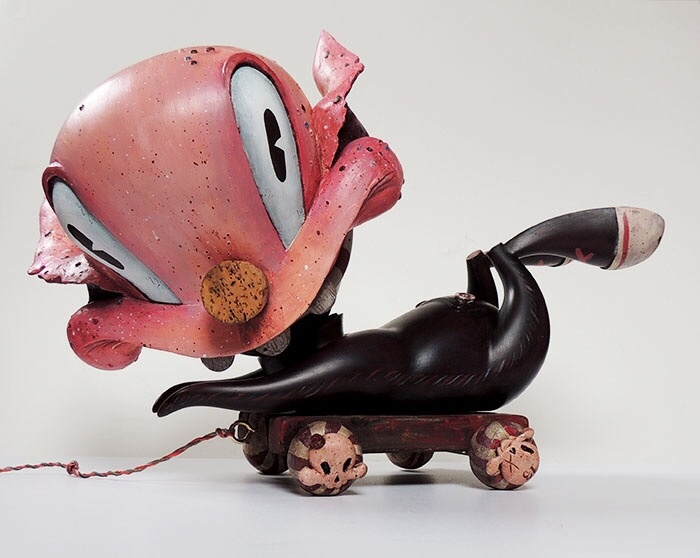 The show was set to open in May and feature an impressive lineup of artists customizing SF's signature character to celebrate the 3rd anniversary the gallery. Needless to I was happier than a monkey in a banana patch to be invited! I was handed a large blank Skelve cart figure and told to have at it. On the plane home from ABQ I began sketching up some ideas to marry my Grimley character with the Skelve platform, I felt it would be a good fit. Up until this point I only dabbled with sculpting, mostly modifying KR Munnys or doing small one off sculpts. I was interested in learning more about how to create molds and cast multiples in resin. I had done some simple cast resin masks for the Deadeyes show but wanted to try a two part mold to fully realize a 3d character. This turns out to be a bigger challenge than I had originally thought. Here's the blank Skelve Cart. I covered the back portion of the head with cling wrap and used a two part apoxy sculpting clay to create a hard positive of the back of the face piece. This would allow me to sculpt on that blank plate and have it line up properly once cast. Those are visible in the lower right corner. Skelve cart designed by Brandt Peters and Kathie Olivas. This is my first stab at using Monster Clay. I love it, really easy to work with and hardens nicely so you can handle it with your bare hands. My first sculpt here leaves something to be desired... but it's a start. I re-sculpted some pieces and it's starting to get to a good place. Details! Exaggerated the ears a bit to give them the appearance of being whipped around in the wind. Also added moles and freckles. Now for the hard part - the mold box. The sculpt is an odd shape and building a mold box around it was a pain in the cheeks. Ultimately this wound up eating up a lot of silicone and being a very difficult mold to work with. What I should have done was sculpted the ears as separate detachable pieces, molded and cast them separate from the head and then attached them post casting with a 2 part resin adhesive. Learning is fun kids! After wrestling with the mold several times I was able to successfully pull two complete and clean Grimley faces. 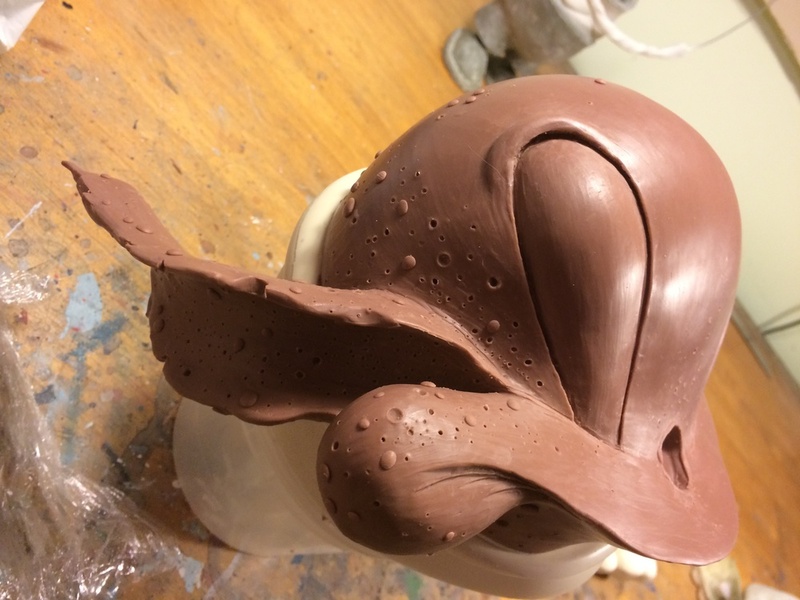 You'll notice this face has a bulbous nose, the sculpt and mold had an inset nose hole. During casting part of the mold broke off and created a void that cast as a bulbous nose. Nothing a good spade bit on the drill can't fix. Skull hub caps for the new cart I built for this fella. Sculpted using a two part apoxy clay. The completed Grimley head with his nose hole all corked up to keep the bad thoughts inside! Finished and shipped off to Albuquerque! If you stand around brandishing and axe you’re not gonna make a lot of friends. Shipping these fools off to @strangerfactory in #abq for All of Everything Erased. Work in progress for @strangerfactory this April. Hey Gang! I've got a new solo show, All of Everything Erased opening @strangerfactory April 5th, in Albuquerque. Come see a bunch of strange paintings of crazy dorks covered in weeds and grass. Also, the super talented @jopagu will be showing his new works at the gallery as well. Prepare your eyes to have their minds blown! This is pretty much a space for me to share process and works in progress in more detail that I do on Instagram or Facebook. I will attempt to keep up with this blog but I will warn you that I get easily distracted... look at that shiny thing over there!